It is a simple way of using a network connection to make a folder in your local antiX system available to other systems. 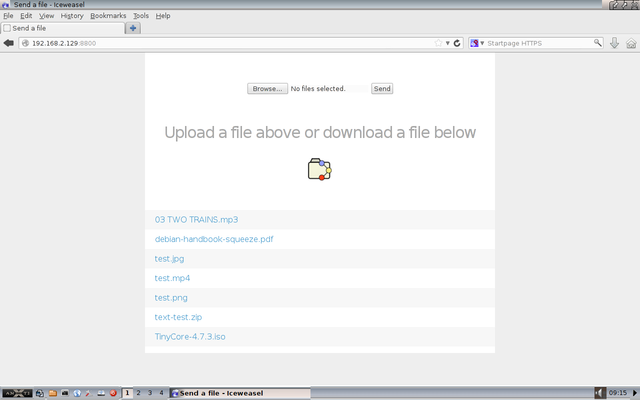 The remote system can upload and/or download files to and from the folder. Additional apps are not required on the remote system. If it has a web (internet) browser it can access your folder. Files can be transferred to and from a PC, laptop, smart phone etc. The remote system can be Linux, Mac, Windows etc. As long as you have a folder named Public in your home folder, and have x-terminal-emulator installed, Droopy will work without changing any settings. A window opens to indicate the Public folder is being served. The main body of the window is used to monitor which system is accessing the served folder and what that system is doing. The titlebar shows the location of the served folder, the local system name, and the IP address plus port number Droopy is using. The latter parts are used to contact Droopy from a remote system. While the window is open Droopy continues to serve the Public folder. To stop serving it, simply close the window. Put some files in the Public folder to make them available to download. On a different system open a web (internet) browser e.g. Iceweasel. If a domain name server (DNS) is running on your network a name can be used instead. On the system that is running Droopy, open a web (internet) browser e.g. Iceweasel. In the banner, click Discover the address of this page. This shows the IP address plus port to be entered into the web (internet) browser in the remote system which may be anywhere in the world. Droopy is likely to be running behind a firewall or a NAT router. To enable transfer of files across the internet they must be configured to allow connections on port 8800 to your Droopy system. Because each firewall/NAT router does this in its own way, you should refer to its user manual to do the setting up. Once the connection has been established, files may be transferred in the same way as described above. You can control the Droopy server by changing its settings. Usually the default settings do not have to be changed for Droopy to work. If your system does not have x-terminal-emulator installed you have to tell Droopy the name of the terminal emulator to use. To do this open droopy.conf in a text editor. In the file, find the section that sets the terminal emulator. The default setting is for it to be left empty (blank). 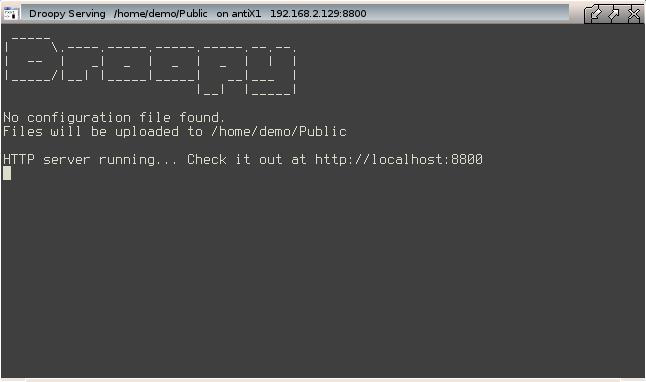 Simply enter the name of your preferred terminal emulator and save the file. Each of the other settings has its own section laid out in a similar way. Guidance is provided to indicate the purpose of the setting and its default value. After changing a setting Droopy should be restarted for it to take effect.